measurements must specifically include, infrasound and low frequency noise, (using dBLinear, dBC, as well as dBA) and in the case of wind turbines must use narrow band analysis. The noise monitoring must be performed by accredited acousticians demonstrably independent of the noise polluting industry, approved by the sufferers, and in a manner that will avoid any deliberate manipulation of turbine operation or other noise polluting operations to reduce the acoustic emissions during testing. The results (including all the raw data and associated sound files) must be made available to all parties. The figure above clearly demonstrates why using a dBA filter will not measure the total amount of sound energy present, (represented by the area under the solid thick blue line with the descriptor “Van den Berg 2006 Unweighted”) in the case of emissions from wind turbines. The blue shaded area represents the total wind turbine sound energy present, but not measured, by using dBA. Using a dBA filter to measure wind turbine noise will omit low frequency noise (measured using dBC), and the total infrasound present (measured using dBLinear). Using dBG omits a significant portion of sound energy present at frequencies below 4Hz, and is clearly inaccurate below 10Hz. Salt, A.N. and Kaltenbach, J.A. (2011). Infrasound from Wind Turbines Could Affect Humans. Bulletin of Science, Technology and Science. (Aug 2011). 296-302. Knowledge of the damage to health from exposure to infrasound 8 and low frequency noise 9 (ILFN) has been known for many years. Despite this, little is known about the current exposure levels of residents to ILFN emissions from wind turbines inside their homes. These symptoms have been reported to occur specifically with exposure to operating wind turbines by medical practitioners since 2003.12,13,14,15,16,17 Symptoms have been reported by acousticians, health practitioners and residents from countries including Denmark, Sweden, Germany, United Kingdom, France, United States, Canada, New Zealand and Australia. Symptoms have been reported historically up to 4km from the nearest wind turbine, and more recently characteristic symptom patterns have been reported at distances up 10km away from the nearest wind turbine.18 This is described especially with larger wind turbines (eg 3MW), and on occasions even further away, where turbines are sited at altitude19 or near expanses of water. Professors Moller and Pedersen, from the University of Aalborg in Denmark, have confirmed that larger more powerful wind turbines emit more low frequency sound waves as a proportion of their sound emissions.21 These emissions are known to easily penetrate through the walls, roofs, and windows of homes and workplaces, due to the lower transmission loss of low frequencies. Recent acoustic survey work in the USA (Falmouth)22 and Australia (NSW)23 has confirmed that low frequency noise and pulsatile infrasound emitted by wind turbines have been measured inside the homes and workplaces of sick people, and occur when they are experiencing the symptoms of Wind Turbine Syndrome. 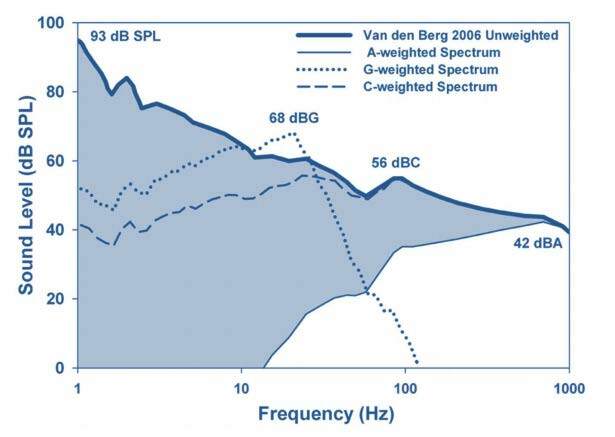 Currently governments around the world do not require measurement of the full sound and vibration spectrum, do not require measurement inside homes and workplaces, do not require evaluation of sleep or other disturbances, but instead limit almost all assessment to audible noise (dBA) only, outside homes and workplaces. The plight of people made ill by wind turbine and other sources of infrasound, low frequency and vibration acoustic pollution has been universally ignored by their respective governments. The current noise assessment practices and standards are incompetent and unacceptable, and must be changed to include full spectrum acoustic monitoring inside and outside homes and workplaces as a matter of urgency.